IEI unveiled a Linux-driven “Puzzle” series of 1U rackmount network appliances and uCPE systems with VNF support and a choice of Intel Coffee Lake, AMD Epyc 3000, Armada 8040, NXP LS2088, and Cavium Octeon CPUs. IEI is launching a new family of Puzzle-branded 1U network appliances that supports software virtual network functions (VNFs) and real-time software-defined wide-area network (SD-WAN) services. The Linux-powered rackmount systems can also be used for uCPE (Universal Customer Premise Equipment) systems and will be available with a variety of x86 and Arm processors. The only models with product pages are based on Intel 8th Gen “Coffee Lake” CPUs: the Puzzle-IN001 with a Xeon E-2136 and the Puzzle-IN002 with a Pentium Gold G5400T (see farther below). These will be followed by Puzzle systems based on the AMD Epyc Embedded 3000 and Marvell 8040, which will be followed by NXP QorIQ LS2088 and Cavium Octeon CN8300 based Puzzle appliances. The upcoming Puzzle-A001 and Puzzle-A002 systems run Ubuntu on the up to 16-core, Xeon-like AMD Epyc Embedded 3000 SoC, which has also appeared on Ibase’s 1U rackmount FWA880 network appliance. The Puzzle-A001 is the high-end model with 4x 10GbE SPF+ and 8x GbE RJ45 ports. An optional smart NIC increases performance and provide functions such as virtualization and packet processing. The lower-end Puzzle-A002 has 6x GbE ports, as well as a mini-PCIe slot and 2x PCIe x4 slots. An older AMD R-Series SoC is available as an alternative for both models. An “entry level” Puzzle-M801 system in the works based on the Marvell Armada 8040 (or A8040). The quad-core, 2GHz Cortex-A72 based Armada 8040 recently appeared on a SolidRun CEx7 A8040 COM Express Type 7 module, which drives the sandwich-style ClearFog CX 8K SBC. The Puzzle-M801 appliance offers dual 10GbE SFP+ ports and 4x GbE RJ45 ports, as well as a “brilliant AI hardware ready system ideal for deep learning inference computing,” says IEI. No separate announcements were made for the unnamed NXP QorIQ LS2088 and Cavium Octeon CN8300 based Puzzle appliances. 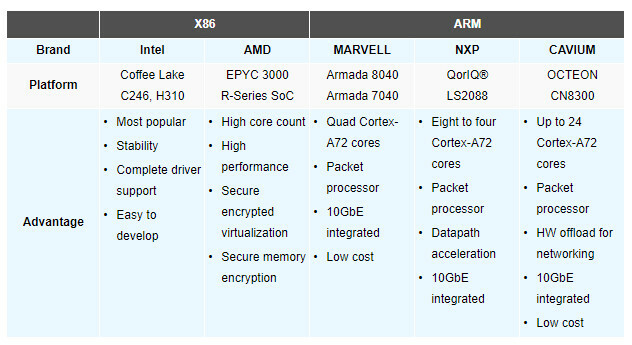 The feature comparison chart above, however, says the NXP offers the LS2088 SoC in quad- or octa-core versions. The SoC previously appeared on X-ES’ VPX form-factor XPedite6370 SBC. The LS2088 Puzzle appliance features at least one 10GbE port. The Cavium-based Puzzle appliance will use Cavium’s up to 24-core, Cortex-A72 based Octeon CN8300, which appears to be new. It also features 10GbE support. All the Puzzle systems ship with a Puzzle Finder software API for developing “environment and network applications,” says IEI. The API provides system management, resource monitoring, version maintenance, software installation, software updates, and information on CPU, memory, Internet, and more. The initial Puzzle-IN001 and Puzzle-IN002 systems run Ubuntu 16.04.04 on an Intel 8th Gen Xeon E-2136 and Pentium Gold G5400T, respectively. Both models also support the 8th Gen Core i3-8100T. The Puzzle-IN001’s Xeon E-2136 is a dual-threaded, hexa-core SoC with 3.3GHz/4.5GHz clock and an 80W TDP. It’s accompanied here by an Intel C246 chipset. The Puzzle-IN001 ships with up to 32GB DDR4, and offers 8x GbE ports, a console port, a serial port, and 2x USB 3.0 ports, with 4x USB 2.0 interfaces available internally. The system is equipped with dual 2.5-inch SATA bays and an M.2 B-Key 2260/2280 (SATA & USB 3.0) slot. You also get mini-PCIe, PCIe x4, and PCIe x8 expansion slots. A TPM chip and 4x cooling fans are also available. The lower end Puzzle-IN002 ships with Intel’s dual-core, quad-threaded Pentium Gold G5400T, whichi is also available on IEI’s KINO-DH310 Mini-ITX board. No clock rate was listed by IEI, but the chip supports up to 3.1GHz. There’s also an Intel H310 chipset. The Puzzle-IN002 supports up to 32GB DDR4 and offers a 2.5-inch SATA bay and an M.2 A-key slot (PCIe & USB 2.0). You get 6x GbE and 2x USB 3.0 ports, as well as 2x USB 2.0 interfaces and a serial port. Other features include mini-PCIe and PCIe x16 slots and a TPM header. Four cooling fans are also onboard. No pricing or availability information was available for the Puzzle series of network appliances. However, the Intel Puzzle-IN001 and Puzzle-IN002 appear to be ready for order. More information may be found on the Puzzle-IN001/2 product page and the Puzzle family product page. Previous Which one is right for you?